Dr. Adesman is a nationally recognized pediatrician with special expertise in the areas of parenting and child development. He is a professor of pediatrics at the Donald and Barbara Zucker School of Medicine at Hofstra/Northwell in New York. He is also chief of the Division of Developmental and Behavioral Pediatrics at the Steven & Alexandra Cohen Children’s Medical Center of New York in New Hyde Park, New York. Dr. Adesman is board-certified in both Developmental & Behavioral Pediatrics and in Neurodevelopmental Disabilities. Since 2016, Dr. Adesman has consistently been named one of “America’s Top Doctors,” by Castle Connolly, an unusually prestigious honor for a developmental pediatrician. He has also been recognized repeatedly as a “Top Doctor” by New York magazine, Newsday, and other publications. Education and Training: Dr. Adesman received his Doctorate of Medicine from the University of Pennsylvania in Philadelphia and completed his Residency in Pediatrics at the Children’s Hospital National Medical Center in Washington, DC. He then completed a Fellowship in Child Development and Rehabilitation at the reknowned Children’s Hospital of Philadelphia. Professional Interests: Dr. Adesman has authored and coauthored numerous research articles and review articles for medical journals on pediatric issues and problems. He recently wrote a book on parenting myths -- Baby Facts: The Truth about Your Child’s Health from Newborn through Preschool. In addition, Dr. Adesman coauthored Parenting Your Adopted Child: A Positive Approach to Building a Strong Family with Christine Adamec. Dr. Adesman’s research interests extend across a multitude of pediatric issues. His clinical practice as a developmental pediatrician is focused primarily on children and adolescents with ADHD, autism spectrum disorder, and/or intellectual disability. Grandparenting Research: Dr. Adesman is very proud of his 2017 grandfamilies study which consisted of a nationwide survey of more than 740 grandparents who are raising their grandchildren. This study provided not only important statistical information about grandfamilies, but the respondents also submitted comments conveying their heartfelt concerns and advice for other parenting grandparents. 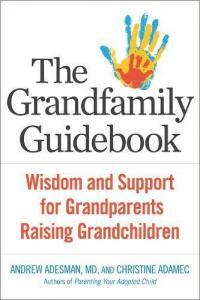 He hopes his grandfamily book will aid grandparents in their very important roles being parents all over again as they raise their grandchildren, whether they have just stepped up to this crucial job or they have been raising their grandchildren for years. Personal: Dr. Adesman is married to a pediatrician, and together, they have three grown children.